Under the umbrella of Research and Development Center, Project lab have been created for different departments. 1 The active HDL software and Xilinx software. 2 The hardware description languages- VHDL and Verilog. 3 Basic programs by using Verilog code. 4 Combinational circuits – Half adder, Full adder. Multiplexer, De-multiplexer etc. 7 Simple Blocks by using Verilog code. Ex. ALU, counter etc..
9 Introduction about the VHDL. 10 Sequential circuits based on VHDL code. 11 Simple projects by using VHDL code. The other activities of this center are to conduct workshop and enhance the knowledge of the students in cutting edge technology. 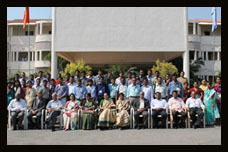 An international workshop on “ACCELERO-BOTIX” was conducted on 1-2 February, 2013. 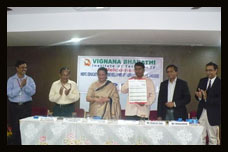 VBIT is now the zonal qualifying center for Indo-US Robo League (IURL), 2013. 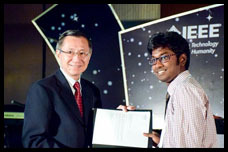 The college has been awarded a certificate of appreciation from Technophilia system and Robotics and Computer Institute of USA. One of the elective subjects offered by ECE department is Nano Science and Technology. 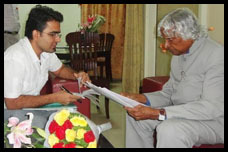 Students have taken up research project in Nano Science and Technology. There is a furnace at the center to produce nano-materials. 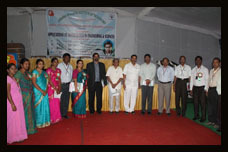 Characterization and listing are done outside the college at Indian Institute of Chemical Technology, Hyderabad. Nickel Zinc ferrites with a composition of Ni0.5Zn0.5Fe2O4 + x Nb2O5 and Ni0.5Zn0.5Fe2O4 + x Sb2O5 (x = 0, 0.1, 0.3, 0.5 by wt %) are prepared by hydrothermal method. The starting materials are AR grade chemicals (Sd. Fine) of Ni (NO3)2.6H2O, Zn (NO3)2.6H2O, Fe(NO3)3.9H2O, Sb2O5 and Nb2O5. All the compounds are weighed with an electronic balance (Infra Digital, INSOL) of precision 0.001gm. Then they are mixed in de-ionized water (AIMS Corporation, Hyderabad). Ammonia solution is slowly added till pH is 8.0 using a pH meter (Chemiline, India). Then the solution is thoroughly mixed using a magnetic stirrer and transferred to an indigenously designed stainless steel autoclave of 1 liter capacity. The solution introduced into the autoclave is heated to a temperature of 200 0C for 4 hours at a pressure of 25 kg. The contents are allowed to cool, and the solution is cleaned thoroughly with de-ionized water and then dried in an oven at 60 0C for 24 hrs. The sample is taken out and powdered using an Agate mortar. The XRD pattern is studied using a X-ray Diffractometer (Bruker, Germany, Model: D8) with CuKα (λ = 1.54A). The particle size and the morphology of the sample is found using SEM analysis. 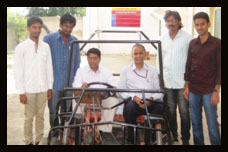 Project lab in Electrical Power Engineering (CEEPE) started in August 2009 with the aim of improving the proficiency of faculty and the students with particular emphasis on research in power engineering including Power Quality improvement using FACTS devices for Smart Grid, Renewable Energy Sources and Power System Protection, Power system operation and control, Power Electronics and Drives and High Voltage Engineering. Extensive Power System modeling and simulation using advanced software MATLAB, Scilab, Power World, P-Spice Multisim have been carried out in the center. 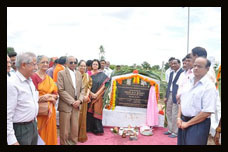 To render necessary technical help to the neighboring community. To promote research and development. 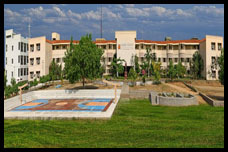 To carry out in-house projects in the above mentioned domains under the guidance of department faculty. To promote technical paper publication. 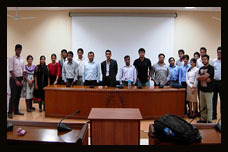 To organize guest lectures from Industry/Academia. To conduct seminars and workshops. To conduct industrial visits and field trips to have an in site idea about the state of the art systems. To under take testing of dielectric strength of oil. Stability enhancement using Fuzzy logic based IPFC for SMIB. Fuzzy logic controller for 3 phase induction motor using multi level inverter. Solar power tracking: solar power controlled by chopper drive. Application of artificial intelligence in power engineering. 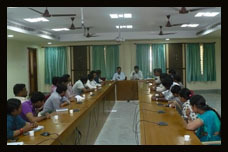 Project lab under the aegis of Department of CSE and IT came into existence in the year 2010. The main criteria for establishing this center is to improve skills of the students as well as the knowledge of faculty by giving training in advanced topics and getting them updated with the latest technologies and trends in the market. 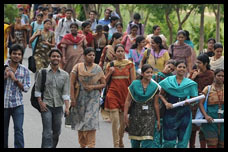 This center is formed by picking up experienced faculty members from the department and recruiting experts having industrial background who can help towards giving proper direction to the students. 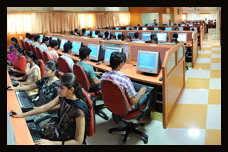 The first and foremost activity of the center is to impart proper training to the students. The center of excellence has taken up different training programs to improve students’ capabilities in understanding the programming skills that are required to develop any project. The main emphasis is given on the basics and in depth knowledge of the subject. 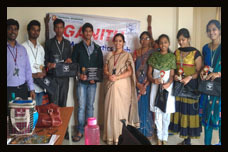 These trainings are being given to 2nd year and 3rd year students so that they can take up projects on their own. The students are allowed to do projects only with premier organizations or else they have to take up in-house projects. 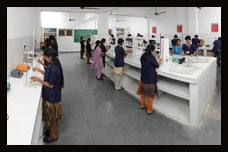 To enable students to take up in-house projects, this center is provided with 60 systems with high configuration exclusively for undertaking project work. Nearly 30 in-house research projects were undertaken in 2012. A data mining project based on MBLM data. An interactive web browser is being developed for IEEE student branch. 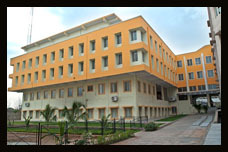 Most of the projects in 2013 are in-house projects at the center. 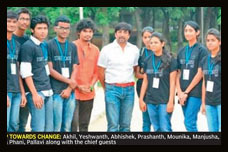 This is helping students to get hands on experience to execute projects. A research project based on MANETS (Mobile Ad-hoc Networks) is regarding with security issues in data transfer. The center of excellence is looking forward to start more research projects and to get some industrial projects which can help the students to grow more academically and make them fit for industry. 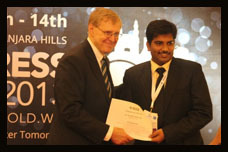 Students are also encouraged to publish papers in journals. The Department of Mechanical Engineering constructed a Wind Turbine in the premises with a view to encouraging the students develop new ideas. 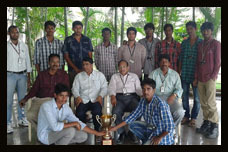 The prime objective of this project is to enhance the technical skills of the young engineers. The Wind turbine presently generates a power of 500 watts, taking wind as a source of energy and which at a later stage, on modification can also be utilized towards the power supply of the college as well. A few concepts of physics such as strength, balance, production, storage and usage are used in the project. These stages were well planned and executed by the team, successfully for erecting the 25 feet tall wind turbine on the terrace of the 60 feet tall mechanical building in the college. Standing 25 feet tall as a symbol of renewable energy source to the entire Aushapur area, it enhanced the appearance of the college and also the technical know how for the students. Wind is a form of solar energy. Winds are caused by the uneven heating of the atmosphere by the sun, the irregularities of the earth’s surface, and rotation of the earth. “Wind energy” or “wind power” describes the process by which the wind is used to generate mechanical power which in turn generates electricity. Wind turbines, like aircraft propeller blades, turn in the moving air and power an electric generator that supplies an electric current. Simply stated, a wind turbine is the opposite of a fan. Instead of using electricity to make wind, like a fan, wind turbines use wind to make electricity. The wind turns the blades, which spin a shaft, that is connected to a generator and produces electricity. The Mechanical part of the project deals with the manufacturing of the Structure, Blades and Rotary components and their assembling. The structure of wind turbine is 20 feet long and constructed with iron and steel materials. Each of the four aluminum blades are of 11 feet diameter and are placed exactly at equal angles of separation (90 degrees). A stopper has been arranged not to cover yaw beyond 360º. This restriction is essential to avoid the wrapping of wires over the column. A smooth axel is placed at the bottom of the generator and wind blade set to allow 300º movement of the system when the direction of wind changes. The Wind speed is ~4 m/sec, in and around the college as per MBLM data, VBIT. Optimum wind speed required for operating the wind turbine for generating higher output is 8m/sec. In the first attempt, when the wind turbine was erected with the above specifications, an 8V AC output was produced as open circuit which was not be sufficient for charging a battery of 12V which requires ~16V output. Therefore, a gear set up of gear ratio 2.5 was introduced in order to maximize the output. 24 poles permanent magnet has been created and developed for its rotor. 20 gauges Copper wire is used for winding. Class B insulation has been carried over. The insulation liquid used for the finished stator is Elmo luft 1A-golden, which is a fast drying insulating varnish that prevents moisture deposition in windings after heat blow. Fiber plastic threads and bamboo slits are used to bind the windings together and keep them intact in slots. Since the air flow rate is not constant, it is desired to maintain speed regulation and keep stable rpm. In order to do that, the speed regulator has been incorporated for the wind turbine by the electronics students. The output being generated at output terminals is ~13V & 500 watts.